Your material could be wood, linoleum, rubber, a Styrofoam meat tray, a potato… (I use mostly rubber blocks, and sometimes wood.) Your ink could be printing ink, a stamp pad, acrylic paint, thick tempera paint, nice juicy markers… (I use proper block printing ink, usually Speedball brand.) And what you print onto could be paper, fabric… You get the idea. Simple. But as Anjar Co. trademarked in reference to their game Othello (another work in black and white), block printing takes a minute to learn but a lifetime to master. There is another “backwardness” to consider. 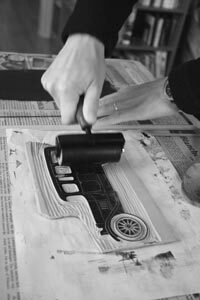 When the carved block is inked, the ink will cover the highest areas, which are the ones that have been left uncarved. Anything that has been carved away will not get inked and will not print and will appear white (or whatever color your paper is). If you think about it, this is the opposite of an ordinary pen or pencil drawing in which the line you make is dark on a light background. 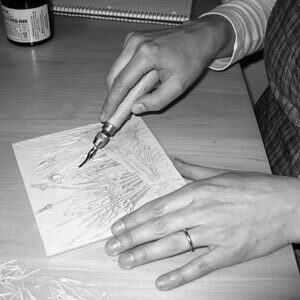 When you carve a relief block, the line you carve will be white on a black (or ink-colored) background. 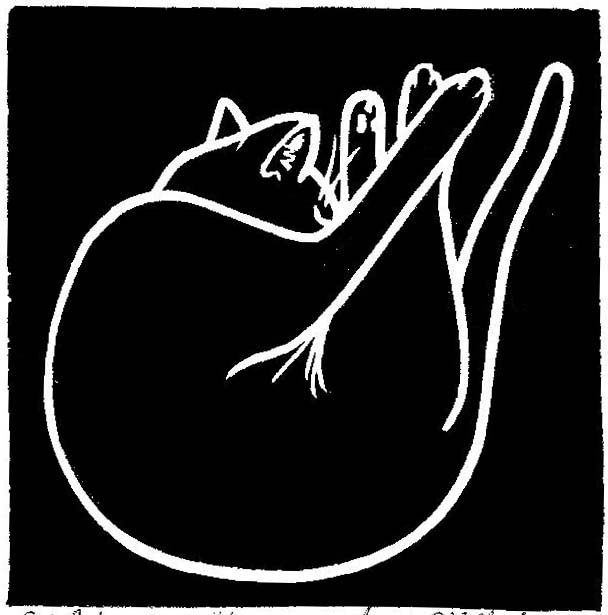 (This is also the opposite of intaglio techniques, including engraving and etching, in which the ink goes down into the carved areas and is wiped off the raised areas, so that what prints is the same line that was carved.) Therefore you could think of relief printing as essentially a subtractive process, almost like carving a sculpture. You start with a solid block and take away, bit by bit, anything that isn’t the image you want. On the other hand, I don’t think of the white areas as merely the absence of black. White and black, ink and no ink, are equal parts of any image, and neither can have any meaning without the other. In the words of Ursula LeGuin, “Only in silence the word, only in dark the light…” And only in light the dark. 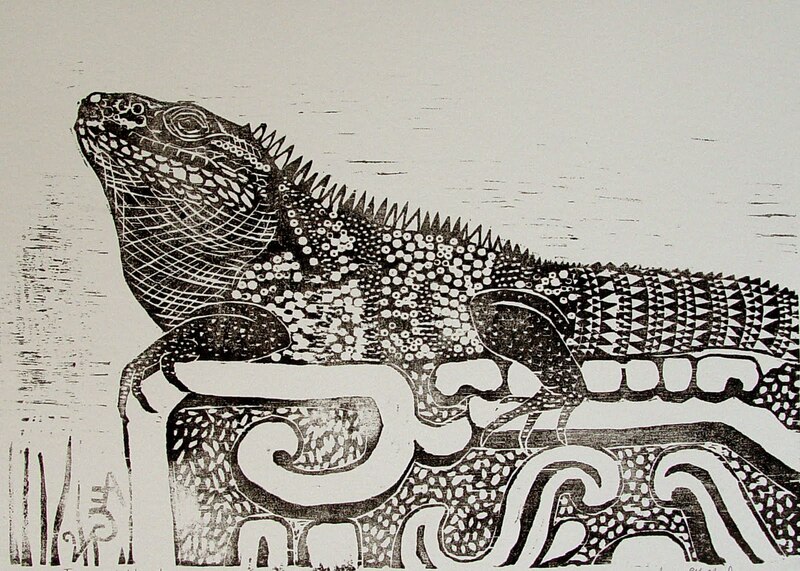 Which brings us to what may be the main difference between basic relief printing and many other printmaking techniques such as etching, aquatint, and mezzotint, plus painting and most other visual art media. In relief printing there are no mid-tones, no grey. There is only black or white, ink or no ink. (Various color and wash techniques can be achieved through inking, as in Japanese printmaking, but not through the carving of the block itself.) I love to see the beautiful soft greys of other printing techniques, but part of what makes relief printing so much fun for me is the discipline of simplifying the complex gradations of all that our eyes see. And yet the simplification should not be a trivialization. Rather, it should be a paring down to the essence. 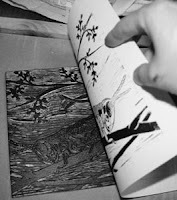 The challenge I enjoy in block printing is neither to reproduce an object or scene with accurate realism, nor to come up with some new abstract vision. Rather, the challenge is to distill an image to its basics: there is only black and white, ink and no ink.